This photo is a little blurry thanks to all the calvados. There are literally hundreds if not thousands of places to get a crepe in Paris. 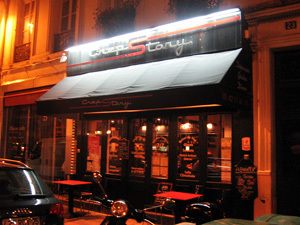 After spending four years in Paris (so far) and eating a few hundred crepes (so far), Crep Story is my current all-time favorite crepe restaurant, and it's also the place I bring my American guests the most often. Along with all the classic combinations they have a few interesting variations on the menu, like cheddar cheese instead of emmental. I'd never heard of cheddar for crepes before (cheddar strikes me as super American and therefore not at all crepe-appropriate), but it's now my selection every time, my favorite crepe at Crep Story being the classic ham, egg, and cheese, but with cheddar in place of the usual emmental. For dessert, my choice is usually the Mont Blanc  creme de marron, chocolate sauce, whipped cream, and a scoop of vanilla ice cream. I cannot imagine a more delicious combination of sweet stuff. Crep Story's small dining room is decorated in a simple, modern style in orange and black, and the staff are fantastic  young, professional, and incredibly polite and friendly. The place is run by a pair of very young brothers, and one or both of them usually wait on us every time we go, which is about once a week these days, and they always remembers our orders as well what we were up to the last time we chatted. Last night after we'd eaten and were finishing off our bottle of wine and making smalltalk with one of the guys, he offered us each a shot of calvados, on the house, and then another, and then we had to quickly get the hell out of there before we were too drunk to walk home. These guys are so kind and friendly we slow down to say hi to them even when we've just passing by the restaurant, seriously. At the beginning of every week I find myself wondering what night I can get over to Crep Story. Definitely check it out if you're in the neighborhood! And seriously, tell them Manning the weird blond American guy sent you.